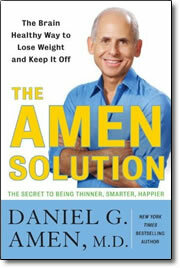 The Amen Solution: Brain-Healthy Weight Loss – by Daniel G. Amen, M.D. – Book CD or DVD – Discount! Dr. Daniel Amen has spent years helping people just like you deal improve their lives by paying attention to brain health. Now, in this breakthrough solution, he applies cutting-edge brain science to weight loss, with astounding, even permanent, results. Have you tried diet after diet without success? Want to know the two major secrets why most diets don’t work? The #1 secret is that most weight problems occur between your ears, not in your stomach. If you want a better body the first place to always start is by having a better brain. Secret #2 is that there isn’t just one brain pattern associated with being overweight; there are at least five patterns. Giving everyone the same diet plan will make some people better, and a lot of people worse. Finding the right plan for your individual brain type is the key to lasting weight loss. Packed with insight, motivation, and everything you need to get started right away, The Amen Solution will help you lose unwanted weight and teach you the strategies to keep it off for a lifetime.